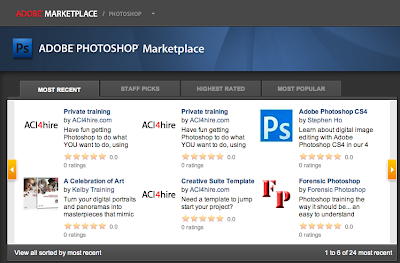 If you haven't checked out the Adobe Marketplace yet, head on over. You'll find all sorts of Adobe Air apps and tons of goodies to quench your Photoshop thirst. You'll even find the Forensic Photoshop book listed, how cool is that. There's a brand new line-up of CS4 related shows on Adobe TV. For more info ... click here. I received this e-mail from Canon regarding the PowerShot G10 and thought I'd pass it along. Products whose serial numbers include any of the following as the fourth and fifth digits from the left may be affected. This phenomenon does not occur in all images. This phenomenon is not caused by the camera settings. The length of lines that appear in images differs depending on the subject. Images that exhibit this phenomenon cannot be fixed. Ed. note: If you have a G10, you'll notice the problem as soon as you use the Smart Sharpen Filter. These lines will jump out at you. 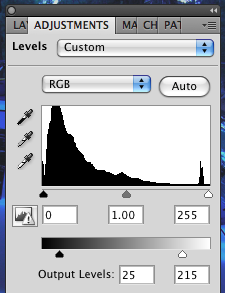 I bought the G10 around the same time that I upgraded to Photoshop CS4, and this problem was driving me nuts. Thankfully, Canon figured out the problem and sent all registered owners the note on how to fix it. Understanding that not everyone fills out the registration card and sends it in, I thought that I'd pass this along. 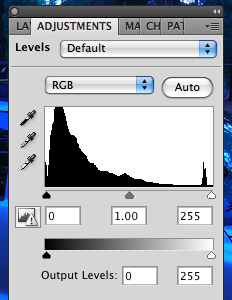 Also, you may receive images shot with a G10 and wonder if you've done something wrong in processing them. According to Canon, images with this problem can't be fixed ... so avoid using Smart Sharpen. In a new sign of trouble in the Metropolitan Transportation Authority’s effort to install a $300 million network of digital security cameras to protect the transit system, the authority’s contractor has asked a federal judge to let it walk away from the project. In a lawsuit filed Friday in Federal District Court in Manhattan, the contractor, Lockheed Martin Transportation Security Solutions, asked a judge to release it from its contract, claiming that the authority had caused numerous delays and failed to give it access to train tunnels to finish the work. The lawsuit, reported Tuesday in The New York Post, is the latest and most public episode in an ugly spat between the authority and Lockheed over the security camera project, part of a group of projects begun after the Sept. 11 terror attack to protect the authority’s transportation system. It also raised questions about how much progress has been made to increase the safety of the subway and commuter rail systems more than seven years after the attack. Read more ... click here. Google launched a new search tool yesterday designed to help Web users find public data that is often buried in hard-to-navigate government Web sites. The tool, called Google Public Data, is the latest in the company's efforts to make information from federal, state and local governments accessible to citizens. It's a goal that many Washington public interest groups and government watchdogs share with President Obama, whose technology advisers are pushing to open up federal data to the public. This month's been crazy busy. I haven't had a chance to keep up with the posts. But, on-tap I've got a series on working with Sony Vegas Pro as well as a look at a product in the consumer market called vReveal ... tips for Latent Print Examiners ... and much more. I got this in the mail from Dorothy at Resolution Video. I thought that I'd pass it along. Free Webinar - Public safety agencies that qualify for the Local Justice Assistance Grants (JAG) program are in a unique position to leverage significant Stimulus funding for their projects. Join Grants Office CEO Michael Paddock on Wednesday April 29th at 2PM EST as we discuss the Local JAG program, application procedures, Recovery Act accountability requirements, and allowable activities. Click here to register. More goodies from Dorothy at Resolution Video. Video Scene Magazine - In the latest issue we take a look at how social and video sharing websites are becoming critical tools for police in the article "YouCrime.com". Article "Desert Heat" gives insight to how the Arizona Department of Public Safety is aiding in the fight against crime through an exclusive interview with Detective Patrick Smith. Also featured are tips on how to prepare for presenting evidence in court and tools for handling video evidence. Click here for more information. Evidence Technology Magazine - This magazine is published six times a year and is distributed free of charge to qualified professionals in the United States who deal with crime-scene investigation, evidence collection and preservation, and forensic science. Click here to subscribe now. Free Software - For the examination and management of video and image evidence, consider the following free software programs. Remember, each program should be reviewed and tested to ensure it meets your own usage requirements. IrfanView - This program is a image viewer and thumbnail browser with impressive file format support and lots of extras. IrfanView is provided as freeware, but only for private, non-commercial use. Gspot Codec Information Appliance - This video codec identification utility provides a variety of information about the files it analyzes. Gspot will analyze standard and proprietary video formats. VirtualDub - A free video capture/processing utility for the Windows operating system. 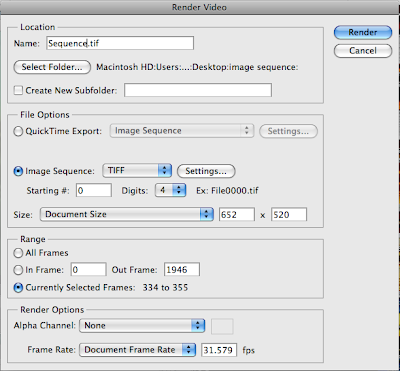 It lacks the editing power of a general-purpose editor (like Adobe Premiere) but is streamlined for fast linear operations over video. It has batch-processing capabilities for processing large numbers of files and can be extended with third-party video filters. Check out Jennifer's outstanding treatment of the coolest photo gadgets for your iPhone by clicking here. I have found that many people using ImageJ never venture to the Help menu. I get a lot of questions that can be solved by just checking out the help files or the ImageJ web site. One of the cool links off of the Help menu is a direct link to the ImageJ plugins page. There you'll find tons of free plugins that dramatically increase the functionality of this cool program. Take a moment to at least Update ImageJ, there's a new release out. Some of the newer plugins will only work with this latest release. I was recently interviewed for the Revealed blog. You can read the interview by clicking here. I've had a few notes in the past about type not displaying correctly when files are shared. Take a look at the available options of these three popular sans-serif type faces. The version of the Eurostile font has no italic variant. Here, Candara has both regular and bold italics. 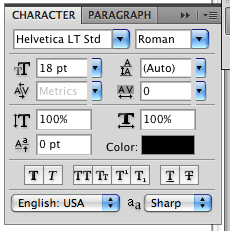 Helvetica LT Std has all of these variants as part of its family. Many programs take the basic font package loaded with your OS and apply a faux set of variants to them. 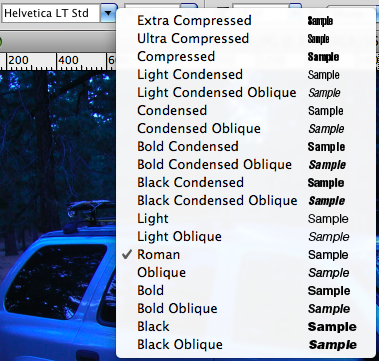 In Photoshop, these variant options are found in the Character panel. While it may be tempting to choose the options for bold, italic, all caps, and etc. from the bottom of the panel, these options will cause problems later. Remember, these options are only simulations. It's better to choose an Open Type font with the correct variant for your needs. "What's Reselect and what does it do," an anonymous comment asked. Let's say you've worked really hard to get a selection of an area around a complex path, then accidently deselected it. Reselect allows for the most recent selection to be reloaded, or reselected. Be careful though. It doesn't work after your image has been resized or if you've created a type layer after you've deselected. I've received a few e-mails regarding my use of InDesign to create contact sheets. Folks want to know how to create the templates necessary to make this cool feature happen. Rather than do a simple how-to on InDesign, I'll refer you to Keith Gilbert's blog on the subject (from 2007). He's gone the extra step and included the scripts and a reprint of his article from InDesign Magazine. Now, I understand that this is an older article and covers CS2 and CS3. However, I also understand that there are still quite a few folks who haven't upgraded to CS4. Communication is key. Using InDesign to create your contact sheets allows for a greater amount of control over your communication's look and feel - allowing you to deliver the right message in the right way. "An NJIT electrical engineer has cracked the code that will enable researchers around the world to detect tampering with electronic images." "Using our program, we can usually inspect a photograph on a computer screen and know that someone has changed it," said Yun-Qing Shi, a professor of electrical and computer engineering. "We still cannot say, nor can anyone else, where in the media the image has been changed. But we will get there." During the training session in Golden, Co., I mentioned the terms "high-frequency image" and "low-frequency image" a few times ... mostly to blank stares. I thought I'd take a moment to jot down some good definitions for future reference. High-frequency images can be seen as having lots of abrupt tonal transitions in a small space. An example of one such image would be a urban scene with lots of bright colours and tons of edges. Conversly, low-frequency images are those where the tone remains relatively constant throughout these small areas and the transitions are gradual. A great example of a low-frequency image would be a facial portrait, the changes in tone being subtle and smooth. Some say that we as practitioners have a duty to help shape policy and case law. Think of the SWGs, the working groups whose job it is to help define the path we all will take. But what about case law? This issue splits many of us as to our proper role. Is it proper for us to be concerned with shaping the law through our testimony and the testimony of our peers? Concerned, yes. What about an active role? Where do you stand? On the government side, one can't really pick and choose what case will receive more attention than others. You work them all and hope for the best. To the extent that you can, you do your best to explain to the court and the jury what the technology is doing, how it's relevant, what you've done with it, and so forth. The private side is a little different. Privateers can pick and choose cases. They can pick them for a variety of reasons; money, convenience, contract, or test case. I think that most will understand the profit motive. Convenience is best explained as working close to home. Contracts mean servicing a particular client or court district. But what about test cases? "Bad legal judgments based on poor or incomplete understanding of technical systems or devices are especially problematic since they are likely to affect the development of industry standards. Bad decisions can also create confusion in understanding where thedefinition of best practices stands for a given forensic discipline at any given time," writes Smith and Bace - noted experts on Forensic testimony. If a privateer sees a case faltering, a case that could have ramifications upon the entire community and create bad case law ... what's the duty to jump in and try to steer it in a "proper" direction. How many are comfortable with the privateer jumping in (given that our system is based upon precedent)? As government agents, would your agency support you lending a hand to a case to attempt to prevent a judgement that would be adverse to your agency or the community at large? If yes, great. If not, why not? Have you asked? All this is to say, I think we are all part of the process. As such, we all have a duty to get into the game and give it our best shot. If we see something, a case or an agency in need of assistance, and we can lend a hand ... why not offer? I, as privateer, relish the chance to get in and help to the extent that I can. I've done it a few times in cases that may have an impact on my other career. I see nothing wrong with trying to leave the system in a better state than I found it. So many investigators have no fear of testifying about their work ... as investigators. But when they have to testify about technical matters, image analysis as an example, they recoil at the thought of having to explain a very complex task to a jury. Why? Why should you fear testimony? Certainly some do fear public speaking in general. This is to be expected; much in the same way a child will fear his/her first trip into the batter's box. The ball does move rather fast. The bat's kinda heavy. Everyone's watching. How will he/she make it? The same way you will. Practice and planning. Start with your warm-up. How do you arrange your work area when beginning a case? Work your way through your SOP. In the theatre of your mind, go step-by-step through the workflow. Can you repeat your own work? Was your work reviewed in your own lab or elsewhere? If so, why. If not, why not. What is it about your experience and training that makes you qualified to work this case? Then go from there. Rehearse your answers. In this way, you hear yourself saying the answers and become comfortable with speaking these technical terms and phrases. You won't get tongue-tied saying "three dimensional colour deconvolution" if you say it out loud enough times. Same is true with other terms like de-multiplexing, photogrammetry, and pixel aspect ratio. If you plan on referring to your notes during testimony, make sure that the print is large enough to read. Try double spacing and using a serif font that's at least 16 pt. Practice and planning can make all of the difference in the world. It should be a regular part of your routine. With a little practice, you'll see court as an opportunity to shine ... not an event to be missed at all costs. More printing problems. It's tough to get prints looking just right. A reader asks about targetting for a specific printer with a small gamut (name withheld to protect the company from needless scorn). He said that the shadows just look solid black and the highlights lack detail. I pointed him to the book and to the Levels Adjustment layer. Often overlooked at the bottom of the dialog box, the Output Levels controls help solve this problem. They allow you to take the current levels and compress them into a saller space. When you use this technique, the levels are remapped. The resulting image has less contrast but should be able to print out on low end printers. You may want to perform a few test prints to get the print looking right. Once you've found the magic numbers, make a note of them. Chances are, you'll be needing them again. I was just kicking it into high gear, getting ready for the Advanced Forensic Photoshop class that the AIFE is offering in late June and the power goes out in the neighbourhood. LA's DWP assures us that it will be back by noon today. It's three hours beyond that already with no relief in sight. So I'm sitting here at a super secret location typing away. The folks at the AIFE are looking to build an interest list for the class. If you are interested, give them a call or send them a note. The class will be held entirely on-line, utilising the Blackboard learning environment. It will feature 6 "cases" that we'll work from start to finish. Each one will be a challenge, and each will present a slightly different challenge from the rest. This won't be a "sit back and watch" event. You'll be expected to work each case and submit your results. Your grade will depend upon not just how well you work in Photoshop, but how well you document your work. You see, we'll be working your files from start to finish. Your "case" has to be documented and repeatable. So you'll get plenty of practice proving each others' work. If the steps can't be repeated or there's incomplete information to perform a task, I'll be on the discussion boards and available by e-mail to help sort things out. So, not only will you pick up some new techniques and some great workflow tips, you'll get a chance to really polish your "game day" workflow. I'm not saying that it'll be Hell's Kitchen meets Photoshop, but there will be a little pressure. The 40 hours of the class must be completed, as well as the final exam, in 2 weeks. Work at your own pace ... but the clock will be ticking. Due to the strenuous and time consuming nature of the course, we'll only be offering it 2 or 3 times per year. If you are interested, send the AIFE a note.